Corporate Reporting in a Digital World - nexxar lab. A guest post by Thomas Toomse-Smith. As part of the Financial Reporting Lab’s project on Corporate Reporting in a Digital World, we set out to understand what investors thought about the current use of different mediums for electronic corporate reporting. In the resulting report Digital Present, we explored investors’ views on the current use of technology in corporate reporting. We heard that many of the mediums that companies used for corporate reporting had not gained traction and that for annual reports, PDF provided the best mix of the digital and non-digital characteristics they desired. Time to pack up and go home? While investors considered that PDF worked well, that does not mean that PDF will, or should be where evolution in reporting halts. The fact that investors value PDF as a communication mechanism for the annual report should be viewed as an opportunity. Investors have already taken a significant step in how they are using the digital characteristics of PDF, and we believe that this demonstrates they are open to innovation when it better meets their needs. In this post, we explore if the characteristics that investors identified for PDF might be considered as a base for digital reporting more widely. While some see this quote as a justification to impose their vision of the future, there is also a somewhat different interpretation. Stakeholders may not know the exact details of what they want, but often they can articulate the benefits they seek. In our Henry Ford example, while users did not understand that they wanted a car, they did appear to know that they wanted to go faster than current horses would allow. The same argument can be made with digital corporate reporting. We may not yet know what it will look like, how it will operate, or the technologies that could deliver it, but we can start to identify the desirable attributes or components which it might demonstrate, to be considered better than what we have at the moment. The Lab’s Digital Present project identified the key attributes for PDF annual reporting that were appreciated by the investment community. When considering these, it is clear that they are not unique to PDF. In fact, they represent the benefits of annual reports delivered on paper with the addition benefits derived from the PDF being an electronic format. Through the original project, we saw that when technology better meets the needs of its users, it is more likely to be adopted. Therefore, for new technologies for corporate reporting to be successful they will need to match or exceed the beneficial attributes of the PDF. Clear level of assurance – Investors value the assurance that companies and auditors provide for the annual report. As such, investors want either the same degree of assurance over digital versions of the same content or clarity as to the extent and nature of assurance provided on the digital report. Defined period – Digital corporate reporting needs to communicate clearly the period which it covers and provide precise version control. Portable and accessible – Digital corporate reporting should be portable (downloadable), be freely available, and accessible across devices and operating systems. Timely – Digital corporate reporting needs to support rapid and wide dissemination on a timely basis. 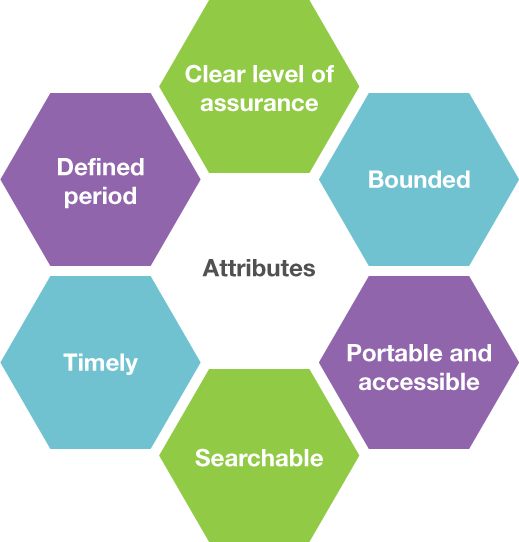 Bounded – Digital corporate reporting should allow the digital boundary to be clearly communicated, putting the information in an established context and enabling users to have a full understanding of scope and content. Searchable – Digital corporate reporting should facilitate the user’s ability to locate the information that they desire quickly and easily. While each of the above components is important individually, it is the way that they work together which provides real utility to investors.